The Perfect Health Diet ebook sale continues! Although the PaleoDork book event is over, Scriber liked your response so much that they’ve decided to contine to sell the Perfect Health Diet Kindle edition for $2.99 for another two weeks. Thank you, Scribner! Unfortunately this is only valid for North American buyers, but if you’re in the UK, Australia, or elsewhere, simply change your Amazon address to a US location and you’ll be able to buy the US edition for $2.99. It’s almost identical save for the units (English, not SI). We have much to be grateful for this Thanksgiving, not least the fact that readers continue to heal themselves on our diet. It’s always nice to hear a success story. Here are a few recent messages. I started on a Paleo style diet as I wanted to ease my problems with Behçet’s Disease. I probably suffered for 28 of my 52 years with this auto-immune disorder and in the last 5 years it was hell on earth. I followed all the diet guidelines from my doctor and the health professionals and none of it worked. I took drugs until I almost rattled; no real help. I went on Google to see if a different diet could help me. After a month of near 24/7 research I found many references to Paleo so decided I should try. At first it was only 80% Paleo as I made the adjustments. I reached almost 100% but allowed myself the odd day off (Birthday’s etc) to preserve my sanity. I read Mark Sisson’s book Primal Blueprint and that allowed me to change the diet slightly. I read books by Loren Cordain, Robb Wolf to name but a few. I then found your book and was so pleased to read about safe starches. That was the hardest thing for me to deal with. I have an Indian/Indonesian heritage so white basmati rice was my favourite with the curries I ate. I have also come to love cream again, full fat organic which tastes wonderful. I was already a big fan of coconut oil and milk, I have about two tablespoons of virgin cold pressed coconut oil each day. The difference? I was not trying to lose weight but I lost 16 kg in 4 months. My only exercise was steady walking which I built up form 1-1.5 miles to 8-9 miles per day. My blood levels were perfect whereas before they were all over the place. The change in blood work only took a month and my doctor was so shocked she ordered another full test. The next results were the same but she refused to believe me when I told her of my dietary change. When she still refused to believe me, I changed doctor! The joint pain in my shoulders and neck has gone totally, my wrists were really painful and they are normal. I just have a bit of tendonitis in my elbows but I am working on strengthening the connective tissue to help that. My skin has cleared, no more folliculitis and just one ulcer in the last 6 months! No more headaches, no more IBS or nausea. No more “brain fog” and just the odd fatigued day. I sleep like a baby for 8-9 hours, I have plenty of energy and awake each day feeling fresh and raring to go. I am starting to see my abs; something I was known for in my youth. People look at me and say “Wow, what have you been doing?” Many don’t believe me, they say I have the “perfect genes” and “I’m lucky” as it won’t work for everyone! Well my wife joined me and she has lost around 10 kg in weight and she’s not been as strict as me! Our DNA has changed less than 0.25% in hundreds of thousands of years but I am lucky because apparently I have changed my DNA….and so has my wife! Oh, my friend had dangerously high blood pressure so she asked me what I was doing and if it would help her. She looked sceptical at first but then I told her I am living proof. She tried it and lost 14lbs in a month. Her blood pressure is now normal – she is both stunned and overjoyed! So my heartfelt thanks to you, I wish you and your loved ones health and happiness. First I wanted to say, I have been one of your followers for many years. I was on Intravenous immunoglobulin once a month for 6 hours a day. I was still on antibiotics all the time and could not keep healthy, and was unsure I would see my daughter graduate, she is 6. I had given up gluten, but it was not enough for my health, I still felt badly. I started eating for the most part PHD and taking supplements. As of two months ago, my body began making antibodies and I have not been sick since last march and I no longer need IVIG! So thank you so much for all you do. You make a difference. It has been a while, but I wanted to follow up with you and say thanks! You gave me some guidance (in addition to PHD) over a year ago regarding my recovery from Post Finasteride Syndrome (PFS). I really appreciate(d) the time you took to email me back with supplement recommendations and encouragement. There are many men who still have not recovered from the persistent side effects of Finasteride use. It’s truly sad. I am grateful to God and the nutritional information that I found on the Internet for my healing. [First message:] This is the first diet I can do in China! Every diet I have tried had a lot of impossible to procure foods. My wife is Chinese ( I am American) and when she saw the picture of Shou-ching, she was suddenly interested. The fact that Shou-ching is Asian gives this diet some credibility with my wife. Before I had trouble getting her to sign on to my diets. Looking forward to full implementation. So far I have been on it for 3 days, and I feel great. My coworker even said, “man, you look healthy today.” That is before I even told him I was on a diet! [Five Days later:] I started to follow Walter Willet’s diet about 10 years ago. I gained 75 pounds! He doesn’t allow potatoes! Or for that matter, any of my ancestral foods. I feel that I was taken in by very bad advice. Especially now that I am struggling with very high blood pressure and other problems. I had been having extremely high blood pressure until I started PHD, in the range of 170-180/105-116. This is on really strong meds. After being on PHD for a week, my blood pressure has lowered to in the range of 140/90 (still with meds, but I need to connect with my doctor to adjust if necessary). I also lost about 4 lbs. This may give me a new lease on life! I want to live! Thanks everyone for giving us so much good news to celebrate! Please have a delightful holiday. Hippocrates famously said, “All disease begins in the gut.” I think we can narrow it down further: much modern disease begins in the mucus. It’s from a paper on the role of antimicrobial peptides in maintaining gut health. The point of the left panel is that a healthy gut is characterized by a thick mucosal layer that shields our intestinal and immune cells from direct contact with bacteria. 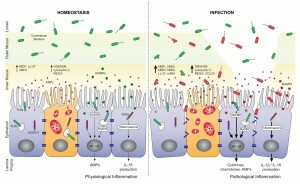 The inner mucus layer is infused with antimicrobial peptides to minimize its bacterial content. The outer mucus layer contains a population of friendly mucin-degrading bacteria – symbionts like Akkermansia who evolved to feed on our mucus. These friendly bacteria provide another layer of defense against infectious pathogens; bacteria tend to be quite good at keeping out competitors. Akkermansia has been found to prevent obesity. Deficiencies of dietary fiber, vinegar, choline, and other nutrients may impair gut motility, leading to concentrations of partially digested food and bacteria at specific points in the intestine. Regardless of why it happens, once bacteria come into direct contact with our gut and immune cells, they trigger inflammation and tend to loosen the gut barrier. This allows live bacteria and cell wall components from dead bacteria to enter the body from the gut. Many of today’s most prevalent diseases are caused by chronic endotoxemia. So it behooves us to avoid it. If endotoxemia is fundamentally caused by the loss of a protective mucosal layer in the gut, how do we assure healthy production of mucus? A recent paper sheds valuable light on that question. It’s well known that in mice, “high-fat diets” induce endotoxemia. But these diets aren’t necessarily high in fat – any pelleted rodent food in which fat provides more than 20% of calories may be called “high-fat.” The critical difference of “high-fat diets” from chow is that they are composed of purified nutrients – starch, sugar, oil, vitamins, and minerals – whereas chow is composed of natural whole foods such as wheat, corn, and seeds. [U]sing complex [i.e. natural whole foods] HFD, no associations were observed between dietary lipid amounts and the magnitude of endotoxemia, inflammation, and physiological alterations developed. It turns out the endotoxemia that typically develops on high-fat diets is due to getting the calories from purified sources – starch, sugar, oil – rather than from whole foods. On a whole foods diet, the amount of endotoxin entering the body is more or less independent of the amount of fat consumed. This is surprising in one respect. Lipopolysaccharide is fat-loving and enters the body along with dietary fat. So it stands to reason that a higher-fat diet would carry more endotoxin into the body. But it turns out the body has mechanisms to regulate how much endotoxin enters the body. It wants a small amount so that the immune system can sample the gut microbiome, but not so much as to cause inflammation. The primary mechanism for controlling endotoxin influx? Mucus production. The study noted that the mice eating higher-fat “had an increased number of goblet cells … [and] an increased MUC2 production.” MUC2 is mucin-2, the primary component of mucus in the gut. It’s obvious that mucin production goes up dramatically as the fat content of the diet increases. If high-fat diets are healthy, we can thank our mucin-producing goblet cells. One last note: the fact that mice can produce healthy amounts of mucus on a 74% fat diet does not necessarily mean that humans can do the same. Humans have much larger brains than mice, and as a result our carbohydrate needs are larger. It’s possible that mice can maintain mucus production on a low-carb diet better than humans can. Warren HS et al. 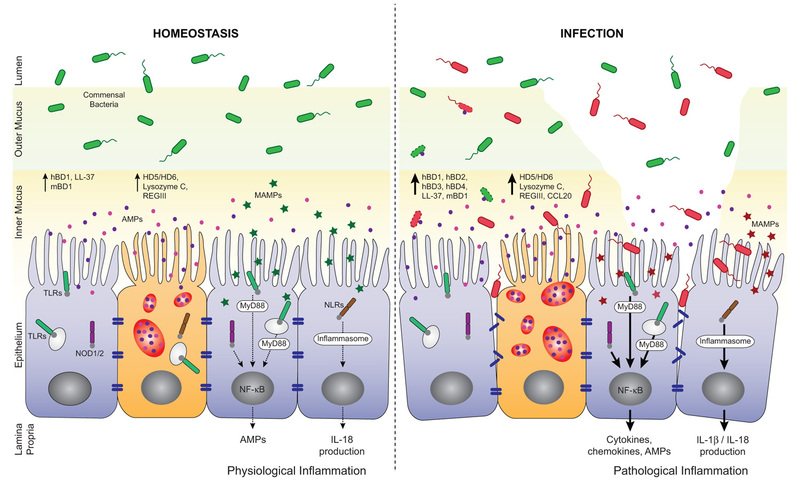 Resilience to bacterial infection: difference between species could be due to proteins in serum. J Infect Dis. 2010 Jan 15;201(2):223-32. http://pmid.us/20001600. Parlesak A, Schäfer C, Schütz T, Bode JC, Bode C. Increased intestinal permeability to macromolecules and endotoxemia in patients with chronic alcohol abuse in different stages of alcohol-induced liver disease. J Hepatol. 2000 May;32(5):742-7. http://pmid.us/10845660. Moreno-Navarrete JM et al. Circulating lipopolysaccharide-binding protein (LBP) as a marker of obesity-related insulin resistance. Int J Obes (Lond). 2012 Nov;36(11):1442-9. http://pmid.us/22184060. Lepper PM et al. Association of lipopolysaccharide-binding protein and coronary artery disease in men. J Am Coll Cardiol. 2007 Jul 3;50(1):25-31. http://pmid.us/17601541. Cani PD et al. Metabolic endotoxemia initiates obesity and insulin resistance. Diabetes. 2007 Jul;56(7):1761-72. http://pmid.us/17456850. Dschietzig T, Alexiou K, Richter C, Bobzin M, Baumann G, Stangl K, Brunner F. Endotoxin causes pulmonary hypertension by upregulating smooth muscle endothelin type-B receptors: role of aldose reductase. Shock. 2008 Aug;30(2):189-96. http://pmid.us/18091567. Lassenius MI et al. Bacterial endotoxin activity in human serum is associated with dyslipidemia, insulin resistance, obesity, and chronic inflammation. Diabetes Care. 2011 Aug;34(8):1809-15. http://pmid.us/21636801. McIntyre CW et al. Circulating endotoxemia: a novel factor in systemic inflammation and cardiovascular disease in chronic kidney disease. Clin J Am Soc Nephrol. 2011 Jan;6(1):133-41. http://pmid.us/20876680. Benoit B et al. Increasing fat content from 20 to 45 wt% in a complex diet induces lower endotoxemia in parallel with an increased number of intestinal goblet cells in mice. Nutr Res. 2015 Apr;35(4):346-56. http://pmid.us/25687164. My hypothyroidism was discovered in 2012. I was age 30 at the time and had just moved to a new part of the UK and enlisted with a new doctors surgery. The condition was discovered by accident when a nurse at the new surgery noticed I had an irregular heart beat. I was sent for blood tests in April 2012 where it was discovered that I had an underactive thyroid. My serum TSH was 11.3. We retested a week later and it was similar, 11.7. Free T4 was 11.1 and 11.6 pmol/l, on the low side. The doctor asked if I had any of the common symptoms of hypothyroidism; I said I was tired in the day and had brain fog in the morning. I regularly go to the gym and run 10k and half marathon races, so the tiredness was noticeable. My mood was sometimes a little unstable too. The doctor prescribed 50 mcg levothyroxine, and I began taking it daily. In July 2012, we remeasured. With the levothyroxine, my TSH had fallen to 3.0 and my free T4 had risen to 17.6 pmol/L – right in the middle of the normal range. Nevertheless, my hypothyroidism symptoms, such as brain fog and tiredness, persisted. In early 2013, I relocated to a new part of the country and found a new doctor. They remeasured and my TSH was now 2.71. In July 2013, it was 2.6. I was still taking 50 mcg levothyroxine daily. In early 2014, I moved again, and found a new doctor. My TSH had risen a little, to 3.3. I decided to start researching causes and cures of hypothyroidism, and started to listen to podcasts from Ben Greenfield and Robb Wolf. Through them, I noticed that some people were successfully curing hypothyroidism through the Paleo diet. This really piqued my interest and I wanted to know more. In May 2014, I sent Ben Greenfield an email saying I was considering starting a Paleo diet to overcome my hypothyroidism and I really wasn’t expecting a reply considering how busy he must be. He kindly responded very quickly saying, “I would say Paleo may be a bit dangerous, ideally I encourage you to follow a diet closer to this one.” He linked to the Perfect Health Diet. A new set of blood tests were taken a few days after Ben’s email which showed a significant decrease in serum free T4 and an increase in TSH levels; free T4 was down to 12.1 and TSH was up to 6.42. The doctor wanted to double my daily dose of levothyroxine to 100 mcg per day. I asked him why he thought I had hypothyroidism, and whether he would recommend that I change my diet to help overcome it. His responses shocked me. He said my hypothyroidism “could be genetic” and “unfortunately it’s just who you are.” He also said that he wouldn’t recommend any dietary changes because I didn’t show symptoms of food intolerance. I decided that I would stick with the 50 mcg dose of levothyroxine, and see if diet could help me. I started the Perfect Health Diet the next day – June 2, 2014. The first 3 months on the Perfect Health Diet yielded weight loss and other health benefits. I was never over weight but I dropped a jean size, started noticing stomach muscles and people were commenting on me losing weight in my face. As I intermittently fasted in the mornings, my clarity of thinking improved at work in the mornings with reduced brain fog. Other benefits included easier breathing through my nose, reduced tiredness in the day, and no more heart palpitations. The first few weeks were a little tough as my body was becoming fat adapted but that soon passed. The diet left me feeling satiated the vast majority of the time and the food I was having were truly delicious combinations. I used the Perfect Health Diet audiobook to scrub up on knowledge while I was at the gym. After 3 months on the Perfect Health Diet, in late August 2014, I had a set of blood tests. My serum free T4 was back to normal at 18.0 and my TSH had dropped to 5.25. Nevertheless, my doctor still wanted to double my levothyroxine dose to 100 mcg. I politely declined as I knew the diet was working and that there would be even better results to come. After 6 months on the Perfect Health Diet, in November 2014, free T4 was up again to 19.2 pmol/L and TSH had dropped again to 3.78. At this point the doctor had no comment except to say that I should stay at 50 mcg of levothyroxine daily. At my next test, in March 2015, free T4 was up again to 19.9 pmol/L and TSH had dropped to 2.08. I continued to take 50 mcg levothyroxine daily, though in retrospect this would have been a good time to begin dropping the dose. At my 12 month anniversary of adopting the Perfect Health Diet, in June 2015, I was tested again. This time free T4 was 27.6 pmol/L – well above normal – and TSH was only 0.12. I was now overdosing on thyroid hormone. The doctor suggested cutting my levothyroxine dose in half, to 25 mcg per day, but I’ve decided to drop levothyroxine entirely and see if I show hypothyroidism symptoms. If I do I’ll try small doses of levothyroxine to see what works for me. I’m eagerly looking forward to my next blood test in three months to see if I am back to normal. I fully intend to continue the Perfect Health Diet indefinitely, and I hope my story helps other people overcome their hypothyroidism. Back in May 2014, when I first learned about PHD and the hope that it gave for natural thyroid healing, and heard my doctor say that hypothyroidism was genetic and incurable and that I would be living with it for the rest of my life, I left the doctors office feeling sad. If diet could heal hypothyroidism, then many people were being misled by their GPs. Now I feel hope. I know hypothyroidism can be healed. Thanks for you hard work Paul, it’s really appreciated.